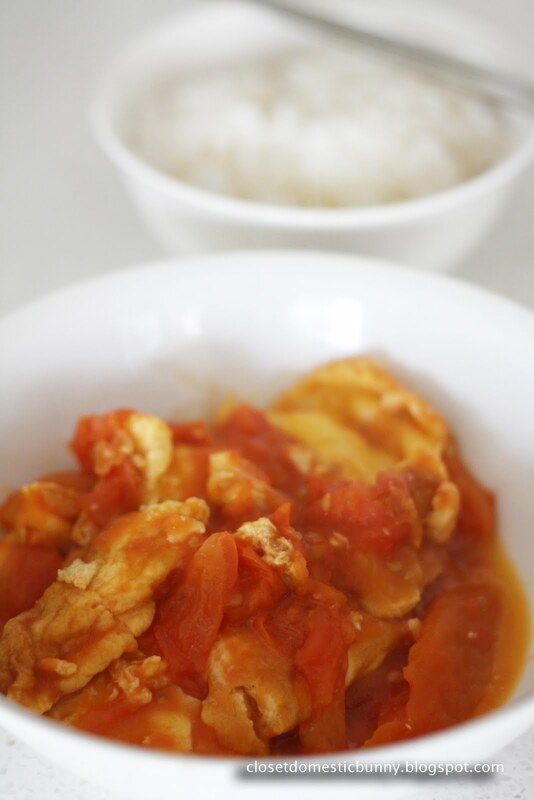 When my older sister introduced me to the deliciousness of chinese tomatoes & eggs half a year ago, it fast became one of my go-to meals when I’ve got nothing in the fridge. It requires only two fresh ingredients. One of which is eggs, which I always have in the fridge (always). The other is tomatoes, which I have in the cold box quite often. It is not such a surprise for me to L-O-V-E this simple dish. I’ve always been a H-U-G-E fan of eggs. If I could stalk ‘em I would’ve. When I was 4 (or maybe 5) years old, I’d ask for eggs to have for breakfast, lunch, dinner and any time in between. My absolute favourite is soft-boiled eggs for breakfast, with its meltingly yolky centre, which coincidentally is my older sister’s most hated. Every morning, when no one’s looking, she’d sneak me her soft-boiled-eggs. We didn’t particularly get along when we were young, but at brekkie time, I was always sweet to her. At the time, my parents were both struggling business owners, they didn’t have the luxury of time to supervise the babysitter. The babysitter didn’t stand a chance against my pleading, whining and crying. I ate so many eggs at one point that I started to break out in boils, yes, the itchy & scratchy kind. Perhaps having half a dozen of eggs a day isn’t such a good idea after all. But because I was just a kid, I didn’t care. All I knew was my eggy best friends were taken away from me. Completely and entirely until the boils disappeared, then rationed to a maximum of 2 eggs per day. You should be glad to know that these days I have more self control than a 5-year-old (most of the time). 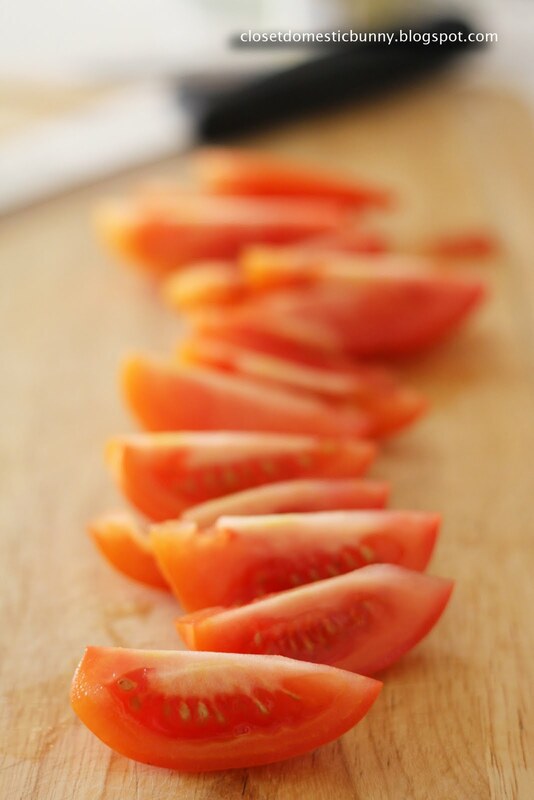 Prep the tomatoes by washing it and then cut into eighths. Aren’t these roma tomato segments so glisteningly pretty? 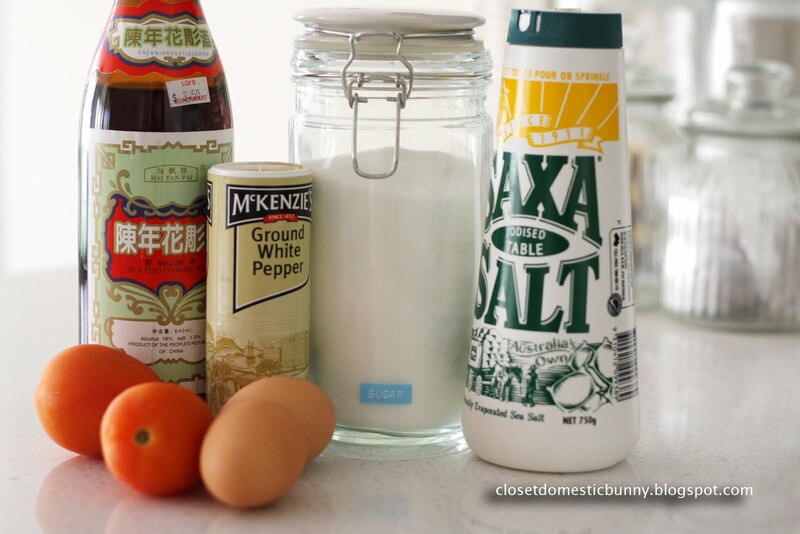 Lightly beat the eggs, shaoxing wine, salt, and white pepper together. Add canola into a saucepan (or a non-stick frying pan with lid) until its bottom surface is just covered with oil. Heat up oil over a medium-low heat. When the oil is hot, add the egg mixture. 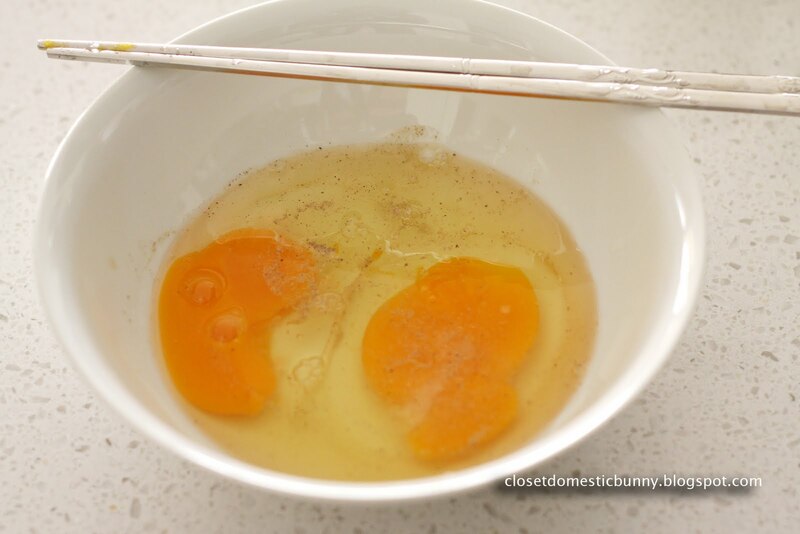 A tip for testing if the oil is at the right temperature is to add a tiny little bit of egg mixture to it. If the egg sizzles straight away, it’s ready. If it sizzled too furiously and burns too quickly, then it’s too hot. 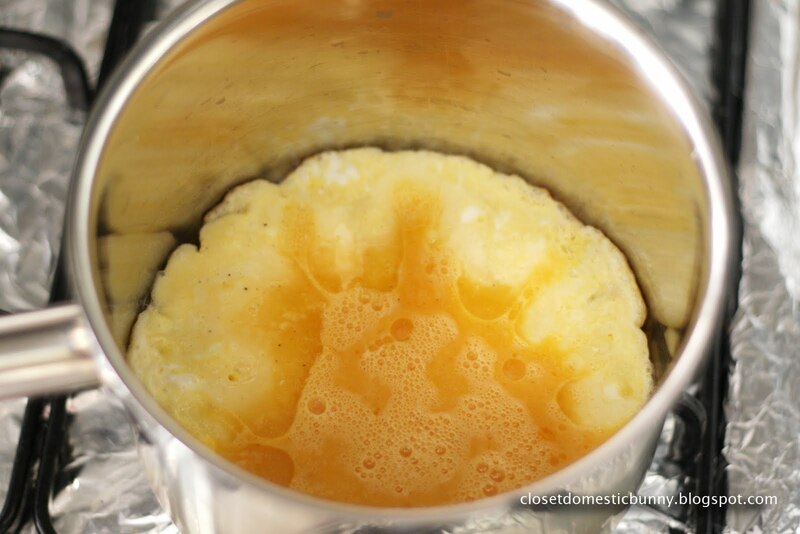 When the bottom of the saucepan is covered with just enough oil, the egg mixture will not stick to it. When your egg is golden brown on one side, flip it to cook the other side briefly. We do not need for the other side to brown as well, just to cook enough so that egg is not raw on that side. We do not want it to overcook. Set aside. There should be enough canola left over at the bottom of the same saucepan to lightly grease it, if not, add a tablespoon of canola. Add the tomato segments. Quickly stir so that it doesn’t burn. 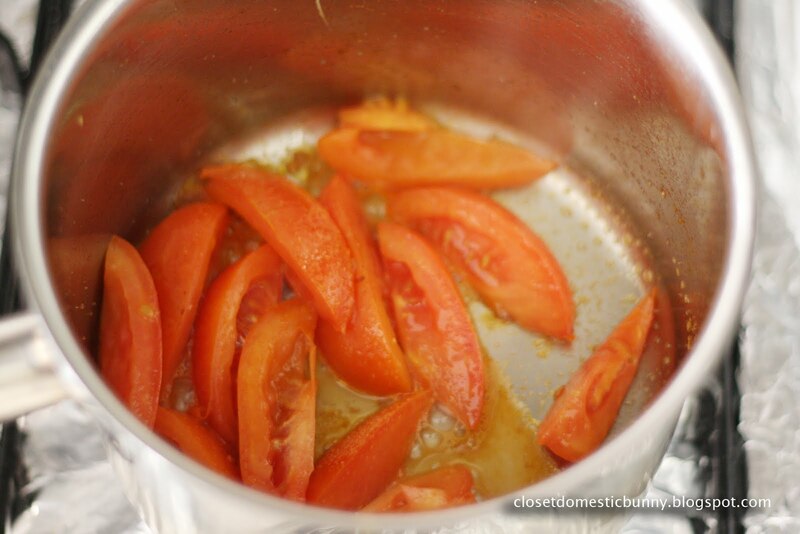 Add 2 tablespoons of water and sugar into the tomatoes. Cover with the lid and cook until quite soft, about 30 seconds. Turn the heat down to low, return the eggs into the saucepan and toss lightly to combine. Serve with a garnish of finely chopped spring onions, if you have them. I almost never do. Eat with a bowl of steaming rice. Add enough oil to cover the bottom surface your saucepan (or frying pan with lid). Turn heat to medium-low until oil is hot, but not smoking. 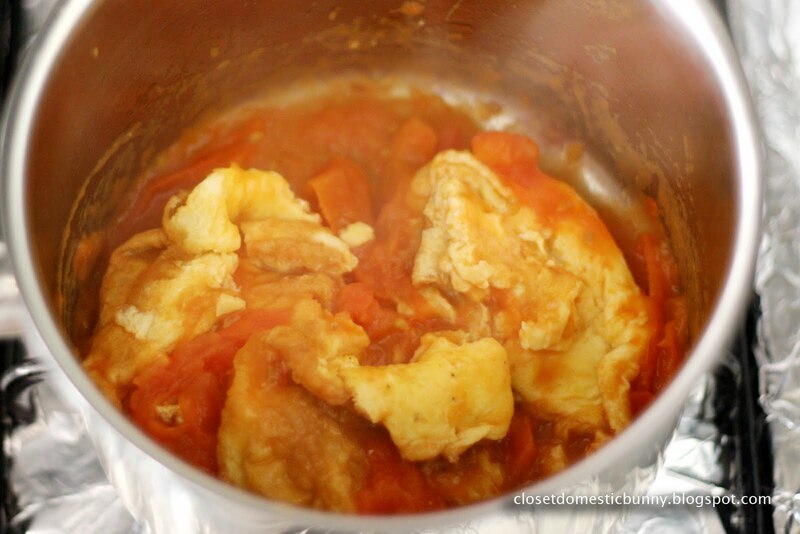 Pour the egg mixture into the saucepan and cook until one side is golden brown. 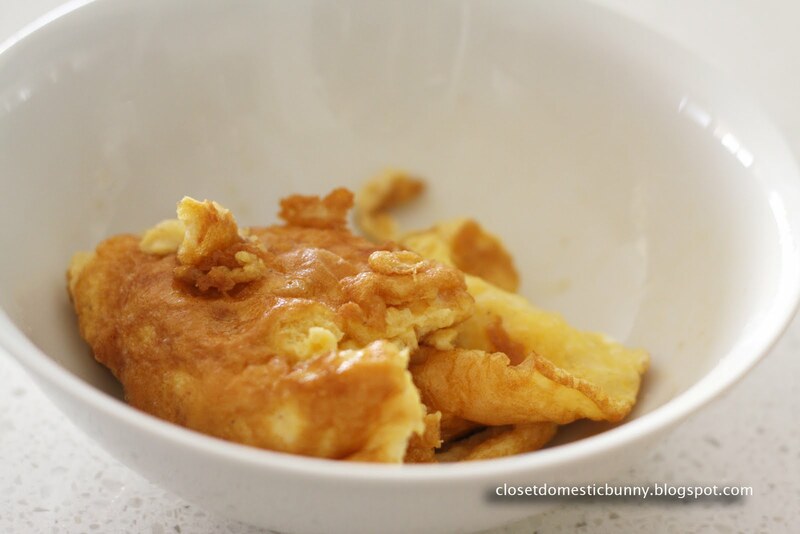 Flip to cook the other side until surface of egg is no longer raw. Set aside. Still over a medium-low heat and using the same saucepan, add a tablespoon of canola if needed. Add the tomatoes. Stir quickly to avoid burning. Add the water and sugar and cover saucepan with lid. Cook until the tomatoes are soft, about 30 seconds or longer. Turn the heat down to low, add the eggs, toss to lightly combine. Serve with a bowl of steaming rice.